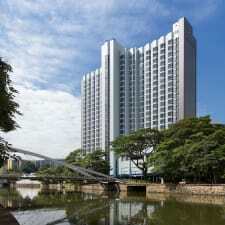 Riverview Hotel Singapore is an elegant property situated along the Singapore River. Modern rooms and suites offer amenities such as international direct dialing, flat-screen TVs, minifridges, in-rooms safes, Internet access and river or city views. Enjoy amenities such as an outdoor swimming pool with cabanas, an Executive Club Lounge, a gym and steam rooms, ballroom, banquet, and business rooms, laundry services and a currency exchange. Free shuttle services to select locations are available outside the hotel. The main lounge also features live entertainment. Guests will be sure to find something tasty to please their palates at this property. The hotel boasts several indoor and outdoor restaurants as well as a coffee house and multiple lounges. Riverview Hotel Singapore is situated within walking distance to area attractions such as Chinatown, Clarke Quay, Robinson Quay and the Great World City Shopping Mall. It's also within close driving distance to Orchard Road, several area expo centers, Universal Studios Singapore and Changi Airport. If you like being close to all the action of the city, you will probably enjoy your stay at this property. Riverview Hotel Singapore sits next to the Singapore River and is in close proximity to a number of area attractions, many of which are within walking distance. This has been a big bonus for several guests, who cited the location and easy access to area points of interest as one of the hotel's best attributes. Most staff members were reviewed as friendly, helpful and willing to assist. A number of visitors had positive things to say about the quality of the food offered at this property; people had good things to say about the breakfast offerings in particular. Possible issues with restaurant services. Though food quality at this hotel has generally been reviewed in a positive light, a few guests did mention having issues with slow service in one of the restaurants. Uncomfortable bedding in some of the rooms. Be warned, you may not have the option of a feather bed here. There have been a few negative remarks about bed mattresses being a little too hard and uncomfortable. Several other guests said they had similar problems with the pillows. Things might need a bit of tidying up. There have been several complaints about upkeep and maintenance in some of the units. Issues cited included mold in bathrooms, broken showers, hot water not working properly and strange smells in rooms.